If you can not attend one of the Town Hall meetings, below is a recording of the Rockdale Meeting. It is broken into two parts, The program and the Q&A session. 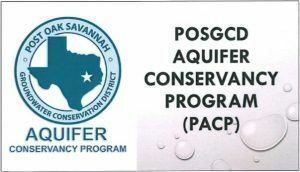 The Post Oak Savannah Groundwater Conservation District (POSGCD) announced today it is forming the Post Oak Savannah Aquifer Conservancy Program (ACP) to create a legacy of stewardship for landowners. This will enable landowners in the District to commit their groundwater resources into a long-term conservation program. POSGCD is empowered by the State of Texas to preserve, conserve, and protect groundwater resources in Burleson and Milam Counties. This ground-breaking conservation program will allow most land owners in the two counties to partner with the District in its mission to conserve the aquifers in this area. Persons owning land above the Carrizo-Wilcox aquifers in the District will be able to commit the water under their property to the ACP for terms of five, ten, or twenty years while still maintaining full ownership and control of their private property. In addition to the important efforts of conserving water locally for future generations, participants will continue to play an important role in management of the groundwater resources in our District. Another thing that makes this program so unique is that the district will pay landowners for their legacy effort in stewardship. Each landowner can still drill or maintain an exempt well for domestic and livestock uses. Landowners can earn $5-$10 per acre, per year for conserving the water under your land. This is a strictly volunteer program, which is funded by fees collected by the district. Payments will be dispersed annually to participating landowners at the end of each year’s commitment.